Why are you living for the weekend? This blog was first posted on Saturday, April 14, 2012 but is still true. 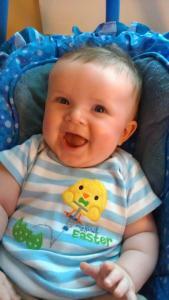 Plus, I love the picture of my grandson, Rory, who six years later still epitomizes the theme of this blog. I hope you are reading this a little later than usual which leads me to the one think I’d like for you to think about today: Intentionally do something that delights you every day. For most people this is never intentionally clarified in their mind but for all practical purposes this is their expectation. They enter a week dreading Monday and longing for Friday afternoon. What a way to live! They expect the work week or the school week to be tough (expectation met :() and they expect the weekend to be great (usually under-delivers :(). Rory is excited about spending his first Easter with “Papa” – a moment of delight. Previous post ← There really is a time to fight!